A particularly beautiful example of this important nautical chart of New York Harbor. Coast Chart No. 120, New York Bay and Harbor, New York. 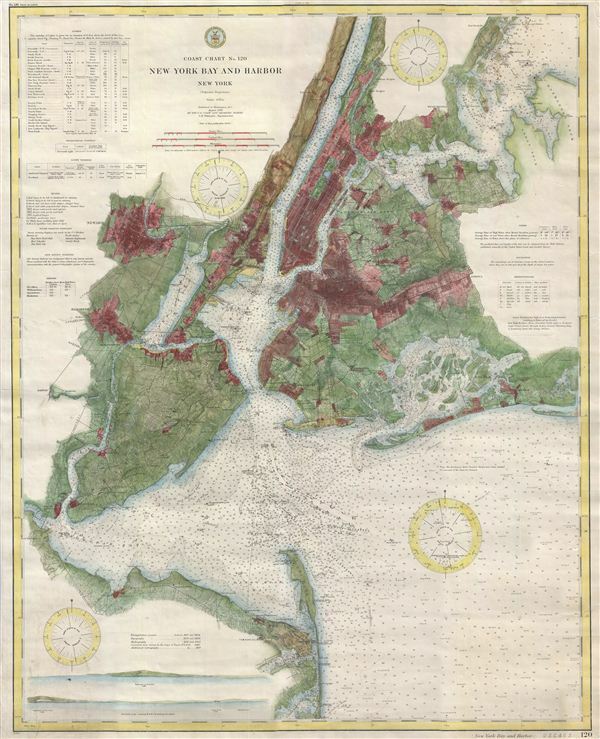 This magnificent map is rare 1910 reissue of the 1866 U. S. Coast Survey chart of New York City, its harbor, and environs. The 1866 U. S. C. S. chart represents the culmination of the Coast Survey's work in the New York City areas. It was, consequently, one of the first 19th century carts to depict New York City as we know it today, including Manhattan, Queens, Brooklyn, the Bronx and Staten Island. The map also includes the adjacent Jersey City, Newark and Hoboken. This reissue updates the 1866 chart to reflect minor changes through 1910 and offers additional detail throughout, including several shore profiles in the lower left quadrant. In addition to inland details, this chart contains a wealth of practical information for the mariner from oceanic depths, to harbors and navigation tips on important channels. Map also includes tables of light houses and beacons, tides and magnetic declination as well as detailed sailing instructions. It is of note that this is not one of the delicate charts issued with the annual Superintendent's Reports, but is rather a high quality independent issue on thick paper and backed with linen. The triangulation for this chart was prepared by J. Ferguson and E. Blunt. The topography by H. L. Whiting, S. A. Gilbert, A. M Harrison, F. W. Door, C. Rockwell and J. M E. Chan. The hydrography was accomplished by R. Wainwright and T. A. Craven. The entire 1866 production was supervised by A. D. Bache, Superintendent of the Survey of the Coast of the United States and one of the most influential American cartographers of the 19th century. This 1910 reissue was printed at the orders of O. H. TIttmann, Superintendent of the U.S. Coast and Geodetic Survey. Very good condition. Issued on thick paper and backed with linen.